Macon Candy: See You on the Sweet Side: All Hail Cesare! Have you done the Dolce yet? Check out downtown Macon's latest nosh pit and Cesare's latest contribution to making Macon cooler, offering small plates, coffee, desserts and adult beverages. It's Mom's kind of eating . . . little this' and thats' to pick with most everything under $5. Tapas: Smoke salmon spread, edamame hummus, Southewestern bean and corn tacos, jalepeno hummus . . . I'll just stop there. You can find them at 484 Cherry Street and opened seven days a week. Thanks again to Cesare for thinking big and bringing us small plates. 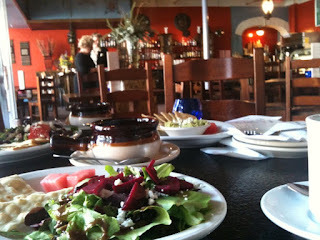 Pictured is the Beet and Goat Cheese Salad and such taken in Dolce Vita's new digs! Thanks to sweet Jackie for the amazing Sunday lunch so Mom's checking account can have a break! Since We're Feeling Spooky, Let's Have a Kookie! Darkness Falls Across the Land . . .
Can I get an Amen for Second Sunday? Since it's Halloween and All . . . This One is for You, Caroline!